#1170 TNT Francie (1971) (often referred to as the 'No Bangs Francie") Also shown is her original dress, white soft low heels, and the box she came in. She came with a clear X Stand. In 1969 the #1170 twist 'n turn Francie got a new shorter haircut and a new swim suit. In 1970 her swim suit changed and Mattel introduced two more dolls; Growin' Pretty Hair Francie and Hair Happenin's Francie. #1170 TNT Shorter Flip Francie (1970) She did not come with shoes. 1971 brought another change, the hard to find, #1170 twist 'n turn no bangs Francie. 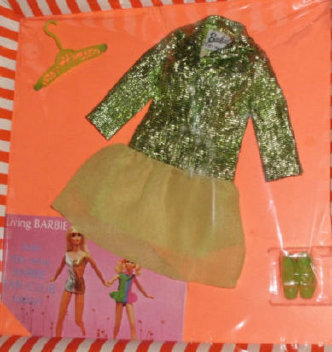 She was made just one year and wore an orange and white mini dress. In 1966 Bend-leg Francie was introduced with brown eyes, blonde or brunette flip style hair and bend-legs #1130. She's was Barbie's teenage cousin, who just returned from England. 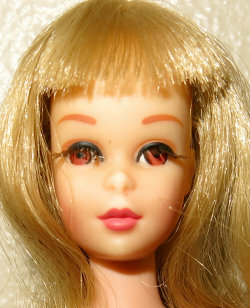 She was the first doll to have real eyelashes. 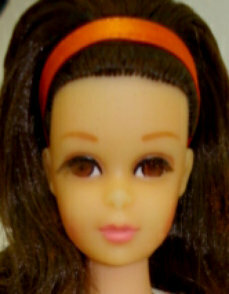 The early bendable dolls had a greyish/tan color skin, and the later issued in 1966 had a pinker skin tone. The pinker dolls came in the suit with the white background. 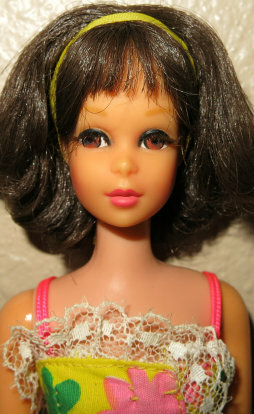 In 1967 Mattel added the #1170 twist and turn waist to her body. By 1969 she cut her hair, and in 1971 she grew her bangs out. In the box was the doll, black wire stand, eyelash brush, booklet, one- piece swimsuit, white soft heels. #1130 is marked: 1965/Mattel, Inc./U.S. Patented/U.S. Pat. and #1170 is marked: ©1966/Mattel, Inc./U.S. Patented/ U.S. Pat. Pend./Made in/Japan.